The title of the panel is â€œCrossing Borders and Boundaries: Emerging Strategies to Promote International Collaboration.â€� This is quite a mouthful. The panelists are Bill Bullock, VP of the North Carolina Biotechnology Center; Avi Hasson, Chief Scientist of the Government of Israel; Montserrat Vendrell, CEO of the BioRegion of Catolonia; and Susan Windham-Bannister, President & CEO of the Massachusetts Life Sciences Center. They will be discussing international collaboration in the life sciences. You will find detailed information about the panel here. Why is international collaboration in life sciences important? I spoke with Susan Windham-Bannister, CEO of the Massachusetts Life Sciences Center. She told me that the main reason for international collaboration is that discovery and development of new products in the pharmaceuticals and biotech sectors generally take a very long time, are expensive, and carry a high risk. International collaboration helps accelerate these processes, which does not only lead to economic advantages for the corporations and institutions involved, but also lets patients benefit from earlier availability of products. Many country and state governments want to help their innovation industries, such as life sciences, grow to provide jobs and prosperity to their citizens. They realize that collaboration projects do not only require local talent in the near term, but also are essential for accelerating the growth of their life sciences industry in the long term. They have come to the conclusion that it even makes sense to collaborate with regions that may be current or future competitors. 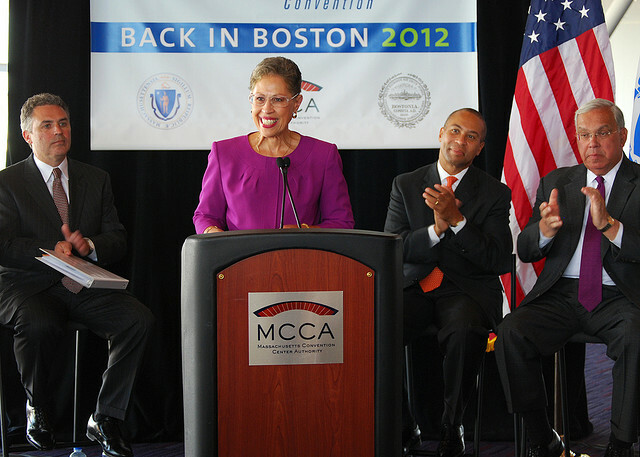 Governor Patrick determined early in his first administration the strategic importance of the life sciences industry for Massachusetts. It is one of the industries that come naturally to our state. We are really good at it. Massachusetts has spawned many new life sciences companies, with an extensive supporting ecosystem growing around them. Instead of watching companies being poached away by other regions, the Governor decided that Massachusetts will protect and grow this strategic industry by actively investing in it. The Governor embarked on international trade missions to the United Kingdom, Israel, Brazil, and Chile. These missions have not only initiated collaboration relationships with traditional life sciences research nations, but also with the new economies. The Massachusetts Life Sciences Center was founded as the vehicle to make sure that the Stateâ€™s investments are maximally effective. An example of a successful program financed by the Massachusetts Life Sciences Center is the Massachusetts-Israel Innovation Partnership, MIP, which resulted in direct collaboration between Massachusetts and Israeli companies. Under this program the Massachusetts Life Sciences Center helps fund the activities of the Massachusetts companies, while the Israeli government funds the Israeli companies. The first round of awards under this program will be announced at the BIO Convention. Why do international companies want to collaborate with Massachusetts companies? The well-educated available talent; the cluster formed by many life sciences companies already in the Boston area; the unique environment for innovation and commercialization; the world class universities; the availability of investment capital; and other factors make Massachusetts a unique place for innovation in the Life Sciences. Read more about why international life science companies should consider Massachusetts to be their U.S. headquarters in this whitepaper. For the Massachusetts Life Sciences Center, the BIO 2012 Convention offers a unique opportunity to meet delegations of U.S. and international governments to connect, build new relationships, find new opportunities for collaboration, and formalize new collaboration projects. The objective is to improve quality of life, in the broadest sense, in Massachusetts as well as the world. The Collaboration panel that I have the privilege of moderating is intended to be a forum for government organizations to exchange information about their programs, share best practices, and maybe even initiate some new collaboration programs. For the general audience it will be interesting to learn what programs exist, and how they can apply for these programs. Join us, if you will be attending BIO 2012! Register here. Jos Scheffelaar is CEO of Launch in US Alliance, Chairman of the Boston Chapter of the Netherland-America Foundation, and a Boston World Partnerships Connector.